While the Formula 1 races bring glitz and glamour to our little island, the rest of us not so keen on motorsports will find that navigation is going to be a pain with road closures where the race is. Where to go to avoid the crowds and the road closures? Here’s four choices on where to go, and what to do, in order to stay away from the F1 crowds. The Formula One weekend is here! Happening on the 14, 15, 16 September, those amongst us keen to catch some racing action would already have gotten tickets on standby. A spectacular event that attracts many tourists from all over the world, it also brings about its fair share of inconveniences: think road closures and crowd surges! While the organisers have tried to minimise road disruptions, the roads around Marina Centre Area would have to be closed for the setup and eventually for the race. In order to make the most out of your weekend even if you’re not going to be at the races, here at Bescene, we’ve put together a guide for you on where to go, what to do to avoid the F1 crowds during the weekend. Zouk Checkpoint is a non-stop dance party starting from 14 September (Friday) to 16 September (Sunday). Each day features a different DJ with their own signature blend of hits and beats. Friday marks the first lap of the checkpoint, with DJ Hong at the console, presenting musical anthems against a backdrop of visuals and lasers. Check out the series and buy tickets here. The More We Get Together at the National Museum features playgrounds from the 1970s to the 2000s. It is an interactive exhibition which invites visitors to participate, explore and reflect about shared space. Perfect for young and old, families with children and dating couples will appreciate this colourful exhibition which will bring back nostalgic memories. Check out more information here. Take a ten-minute boat ride to our offshore boomerang-shaped island, Pulau Ubin. Here on this little island, there is a lot to do. 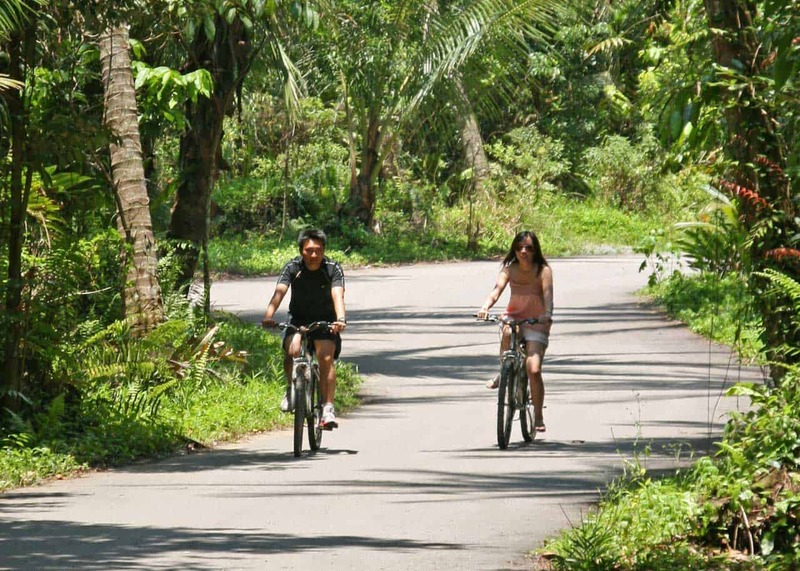 Rent a bicycle and cycle around the island, stopping along the way to refresh yourself with drinks at the drinks hut along the way, or head to Chek Jawa Wetlands, that hosts coral reefs, which are home to a range of marine wildlife, such as sponges,sea hares, octopuses, starfish, sea squirts, sand dollars, and cuttlefish. There is also delicious seafood sold in the restaurants there, where you get to eat in a typical kampung-style housing. If you are there on 15 September, Saturday, the park rangers are holding a tour that will take you through the historical landmarks, wildlife habitats, and restored buildings on the island. For more information, check out the Nparks’ website. Woolloomooloo is situated at 2 Stamford Road, Level 3 Swissotel Stamford, and offers a close enough floor to ceiling view of the action at Turn 9 of the Formula 1 Circuit. A great place to wine and dine so that you are close to the action, yet not near enough to get your eardrums busted. It’s a steakhouse, so expect the finest prime cuts for dinner. Reviewers at Chope have praised the Tuna & Spanner Crab, Jumbo Prawn Cocktail, Australian Black Angus Tomahawk, as well as the Bread & Butter Pudding. For bookings and more information, click here. And there you have it! Avoid the crowds this Formula One weekend by catching your groove at Zouk, or taking a chill trip to an offshore island – the choice is yours. Now you know that you’re not just limited to staying at home while the crowd parties at the world’s largest motorsport race!